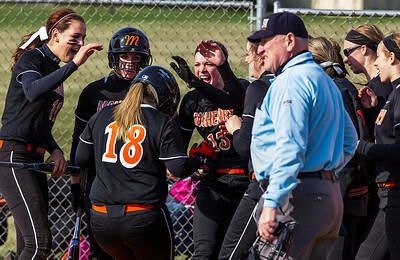 Kyle Grillot - kgrillot@shawmedia.com The McHenry team including Alex Martens (11), Dana Walsh (10), and Rachel Ford (13) celebrates with senior Megan O'Donnell (18) at home plate after hitting a home run during the second inning of the girls softball game Wednesday in McHenry. McHenry beat Cary-Grove, 11-2. Kyle Grillot - kgrillot@shawmedia.com The McHenry team comes together before the fifth inning of the girls softball game Wednesday in McHenry. McHenry beat Cary-Grove, 11-2. 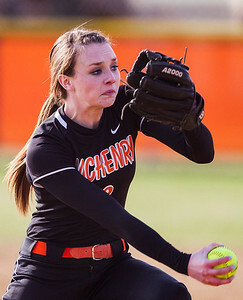 Kyle Grillot - kgrillot@shawmedia.com McHenry junior Kristin Koepke pitches the ball during the third inning of the girls softball game Wednesday in McHenry. McHenry beat Cary-Grove, 11-2. Kyle Grillot - kgrillot@shawmedia.com McHenry senior Megan O'Donnell runs the bases after hitting a home run during the second inning of the girls softball game Wednesday in McHenry. 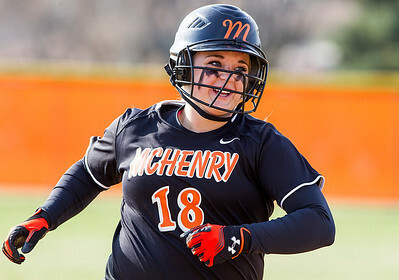 McHenry beat Cary-Grove, 11-2. 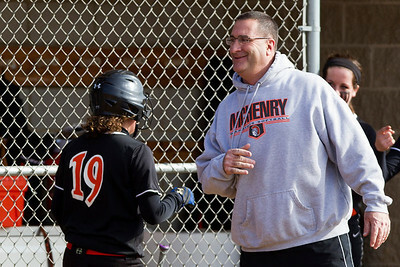 Kyle Grillot - kgriillot@shawmedia.com McHenry senior Hannah Crowley is greeted by coach John Difrancesca after an earned run during the second inning of the girls softball game Wednesday in McHenry. 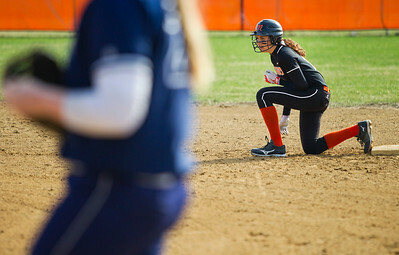 McHenry beat Cary-Grove, 11-2. 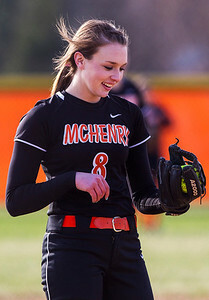 Kyle Grillot - kgrillot@shawmedia.com McHenry junior Kristin Koepke smiles after talking with a teammate before pitching during the third inning of the girls softball game Wednesday in McHenry. 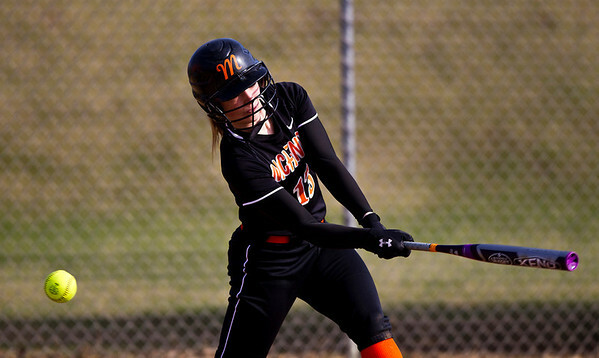 McHenry beat Cary-Grove, 11-2. 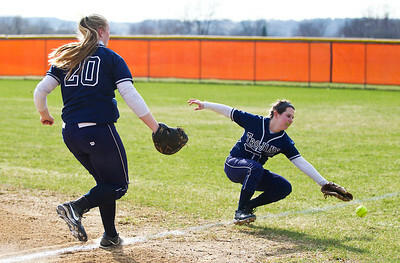 Kyle Grillot - kgriillot@shawmedia.com Cary-Grove sophomore Brianne Prank (20) watches as senior Amy Clemment dives for a fly ball during the second inning of the girls softball game Wednesday in McHenry. McHenry beat Cary-Grove, 11-2. Kyle Grillot - kgriillot@shawmedia.com McHenry sophomore Alex Martens runs the bases after hitting a home run during the second inning of the girls softball game Wednesday in McHenry. McHenry beat Cary-Grove, 11-2. Kyle Grillot - kgriillot@shawmedia.com Cary-Grove senior Amy Clemment hits the ball during the fifth inning of the girls softball game Wednesday in McHenry. McHenry beat Cary-Grove, 11-2. 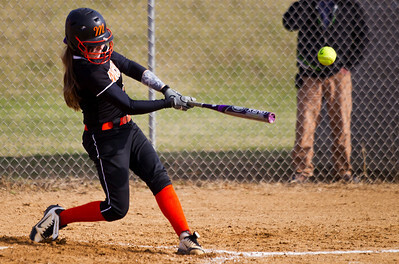 Kyle Grillot - kgriillot@shawmedia.com McHenry junior Carly Mattson hits the ball during the second inning of the girls softball game Wednesday in McHenry. McHenry beat Cary-Grove, 11-2. Kyle Grillot - kgriillot@shawmedia.com The McHenry senior Rachel Ford swings for a pitch during during the second inning of the girls softball game Wednesday in McHenry. McHenry beat Cary-Grove, 11-2. 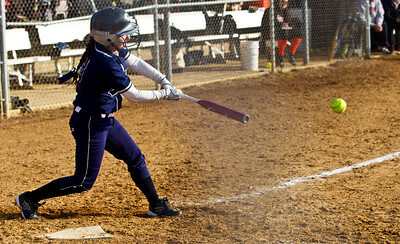 Cary-Grove senior Amy Clemment hits the ball during the fifth inning of the girls softball game Wednesday in McHenry. 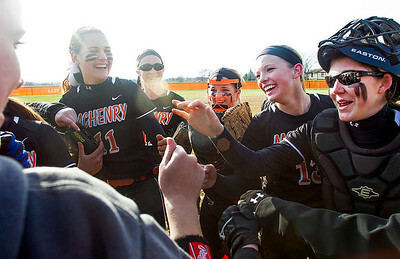 McHenry beat Cary-Grove, 11-2.